You can find almost everything on internet. The information is probably not always reliable, but by comparing different sources, you can eliminate the scrap. I made a search of world population by time zone, but no site did provide me with the complete picture. But, you can find many sites with population by country, and you can find sites with the population by regional and/or time zone in a specific country (Russia, Canada, Brasil, USA, and some others). Wikipedia is often a very good information source. I even found the information concerning some smaller islands. Then i plotted the following graph: those countries and regions that are simultaneously living between “9:00 AM and 23:00 PM” or in other words the sum of people who are “awake”. See the green curve below (left scale). For instance: at 0 GMT, you have about 4 billion people awake at the same time (and a lot of Chinese people and other Asians), and at 15:30 GMT you have 6 billion people awake, in fact almost everybody, less the relatively scarcely populated Pacific Zone. 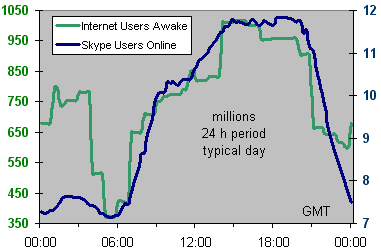 The blue curve (right scale) is the daily fluctuation of concurrent Skype users online in a typical day some months ago. The curves have similar shapes. But, the Asian peak is much higher in the world population chart (beware, scales are different!). Why the difference? In Asia lesser people have access to Internet. 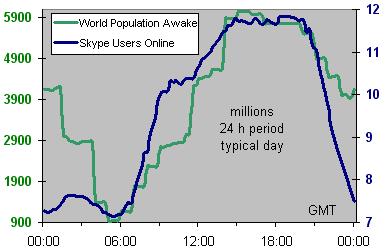 This explains probably why the Skype “Asian peak” is proportionally much lower then the “People Awake” curve. What if i had the internet users by time zone? Would that bring the curves closer to each other? Well, i dug deeper, and found also data about the internet users by country, but “less” exploitable. I had to make for instance the “probably” false guess that the internet penetration in Russia is the same all over the whole country. Here the graph … Almost the same shape as the previous one. What if i had only the broadband users by country and region? Would that graph come closer the Skype graph? Pity, i didn’t find reliable complete data by country yet!